When Ruby Dye, owner of the Curl Up and Dye hair salon in Blessings, Georgia, failed to show up in her usual place at church on Sunday morning, her friends were concerned. When she did not respond to their phone calls or text messages, their worry escalated. Concern turned to fear when Vera and Vesta Conklin, who worked with Ruby at her shop, and P. Nutt Butterman, Ruby’s Sunday lunch date, found her house ransacked and the message “Help Me” written in bloody letters. Ruby has become a valued part of the community, and the town comes together to pray for Ruby’s safety. Ruby arrived in Blessings nearly fifteen years ago, looking for a safe place to escape the abusive husband she had divorced. She found sanctuary and a place to belong in the small Southern town, but just as she feels confident of her safety and is filled with hope that local lawyer Peanut Butterman is the secret admirer who has been sending her gifts for the past several months, Jarrod Dye, her violent former husband shows up at her front door, forces his way into her home, and abducts her. Ruby is afraid that her life may end before she can experience the new happiness she was beginning to believe was within her reach. 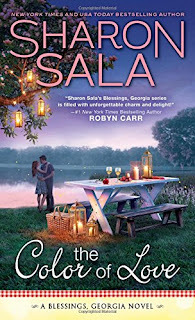 This is just the beginning of the adventures of Ruby and Peanut as these two popular characters finally get their own story in Sala’s latest Blessings novel. The two will get their HEA, but not before danger threatens both of them and they prove that they and their love for one another can survive whatever life throws at them. Woven into the story of Ruby and Peanut are two secondary story threads of good people overcoming adversity. Widow Melissa Dean is unjustly fired from her job, but she faces the blow with determination and optimism and ends up with more than she dreamed. Twelve-year-old Charlie Conroy is doing his best to be the man of the family and take care of his sick mother and five-year-old sister after his father’s death in a meth explosion. But their situation is dire with no electricity and little food in the house. When a nursing home resident goes missing, Charlie and his bloodhound Booger get their chance to show their stuff. They not only find the woman, but Charlie earns $25.00 and wins the hearts and the help of the compassionate community of Blessings for himself and his family. In the fifth novel of this heartwarming series, the town of Blessings once again functions as a central character. It is a small town with the usual propensity for gossip and nosiness that can have a mean edge, but it is also a place filled with good-hearted people who take care of their own. Ruby, who has been front and center of the caretaking brigade in earlier books is less comfortable when it is her turn to be on the receiving end. Determined not to be an object of pity and to stand on her own two feet, she has a difficult time accepting help graciously. Just as she is recovering from her injuries, physical and emotional, evil strikes a second and more devastating blow. Fans of the series will rejoice to see Ruby and Peanut prevail and to root for the other characters who prove that at least in Blessings good guys win. If you like romance that is community-centered with multiple plot threads, a rich vein of humor, and a feel-good finish for more than the focal couple, I recommend The Color of Love. It can probably be read as a standalone, but it will be a particularly rewarding read for those who have watched Ruby and Peanut’s relationship slowly develop through the earlier books. Lest any fans of the series fear Ruby and Peanut’s HEA ends the series, book six, Come Back to Me, a reunion/prodigal son/secret-baby tale, will be released on September 4, 2018. Since I really enjoy Sala’s voice, her atypical protagonists, and the Blessings setting, I have already added the next one to my book calendar. I hope Sala follows the route Jodi Thomas took in her Harmony series and eventually gives us more of the Conroy family as well. I haven't read any of this series books yet but I'm looking forward to it. Thanks for the post. I haven't read this author yet but I've heard good things about this book. Thanks! What a wonderful review. I need to add these to my wish list. I am not familiar with this series. You have given me yet another series I know I would love. Thanks for the review. I am fond of small town stories and this would be right what I would love. I hope you all will give the series a try. 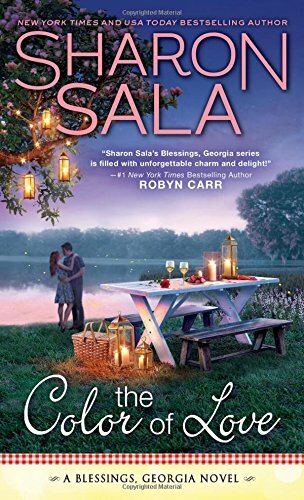 Sala is probably best known for her romantic suspense, but she does an exceptional job with these quirky, heartwarming small-town romances. I agree on all counts. This one really pulled at my heart.